Skywatcher artwork is hand poured, carved, painted, and finished by Skywatcher hands specifically for purchase, or trade, by the public. Funds raised from the sale of these art works goes directly into the TRIBAL LANDS ACQUITION FUND and the new DRAGON RANGERS PROGRAM so that the Skywatchers can acquire lands for their new homeland and nature preserve. Funds can now be sent using PAYPAL or PAYPAYINC. This is the first of the DRAGON HEAT related pins. It features the most popular of the characters; Neried. Each pin is signed and numbered. This pin measures 2.5 inches in diameter. This wall ornament has a hard wood, stained frame measuring 8 x 6 inches. Real Bison hide is suspended in the frame center by four strands of leather cord which have three, hand crafted resin beads on the ends. A leather cord on the top dowel provides the support to hang this tribute to the Bison on a wall. A handcrafted, painted resin relief of the bison is adhered to the hide. Each depends on the availability of the Bison hide. Leather may be used when Bison hide is not available. This item is a pin (or a magnet depending on whether a pin or magnet is embedded into the resin) that also doubles as part of the Bison Wall Ornament. Made from resin and hand painted with a clear protective coating (like all the figurines and pins). Measures 3x2 inches. This pendant is a reproduction of a metal representation of one of the most famous of Dragons; the serpent Dragon; Kukulcan, (which was present in and influenced Olmec, Maya, Aztec civilizations and a few others world wide). In this version of the 'feathered serpent' there are also wings as indicated by an ancient legend (see HISTORY). The Kukulcan pendant is designed to be worn on a necklace. 1 inch long x .08 inch wide. This item is a replica of the 10,000 year old rock carving which is believed to represent the presence of the Skywatcher Clan. This is the smallest pin the artist has ever made, measuring 1 inch by 1¾ inches. This pin (which could easily be modified into a magnet or ornament) is a small 1½ x 2½ inch replica of the Olmec period rock carving of a Skywatcher who visited the Olmec La Venta site 3,500 years ago with the accompanying dragon Kukulcan. This is painted to simulate the rock from which the original is carved but upon request can be colorized. This pin (which could easily be modified into a magnet or ornament) is a small 2¼ x 2¾ inch replica of the Olmec period rock carving of what is referred to as the first and clearest image of the dragon; Kukulcan, who visited the Olmec La Venta site 3,500 years ago with the accompanying Skywatchers. This is painted to simulate the rock from which the original is carved but upon request can be colorized. This is a special pin showing the primary geologic formation of the former Skywatcher Nation and homeland at Kelly Park. The bald eagle pin is the largest of the wearable art pins. A replica of a Timucua arrowhead copied from a restored artifact of 250 years ago. Hand painted to resemble chert with a hold drilled for attaching a necklace. In its unpainted form, it resembles the 'natural resin' arrowheads the ancient Skywatchers would have made. 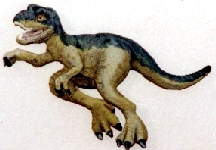 This pin is a representation of the Raptor dinosaurs. It measures 4 ½ inches from claw tip to tail tip. 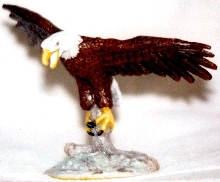 This figurine of the American Bald Eagle balancing on a branch tip is made from a 4 separately cast pieces that are epoxied together to form the completed 6½ inch tall and 10½ wide figurine. This item is a representation of the Chinese style Dragon. It is one of the larger pins. It measures 4 inches from claw tip to horns. This item is a fist sized rendering of a dragon hatchling. Of course, there is no evidence to show that dragons are born from eggs. Dragons were not reptiles. It stands 3½ inches tall. This pin is of a Monarch butterfly that is feeding from the flowers. It measures 3 ½ inches from wing tip to wing tip. This pin is of a Green Sea Turtle. It measures 2¾ inches from tail flipper to nose. This item is a figurine of the dragon; Kukulcan, as depicted in an Olmec carving of Kukulcan's head. The figurine stands 4½ inches tall and is 3½ inches wide. It is made of solid polyester resin and hand painted. This item is a hand crafted by tribal artisians in a variety of styles. Later versions will have clip on dragons. The ring is 7 inches wide.. This item is hand cast and painted with two pins with silicone rubber pin clasps. 2.5 inches from wing tip to wing tip.